Present state: The station house is occupied and not greatly changed since closure. The platform remains together with its sign. The South Tyne Way footpath and cycleway runs along the trackbed past the station. Date of visit: September 1962 and intermittently until April 1976, August 1977, August 2000, December 2009 & March 2010. 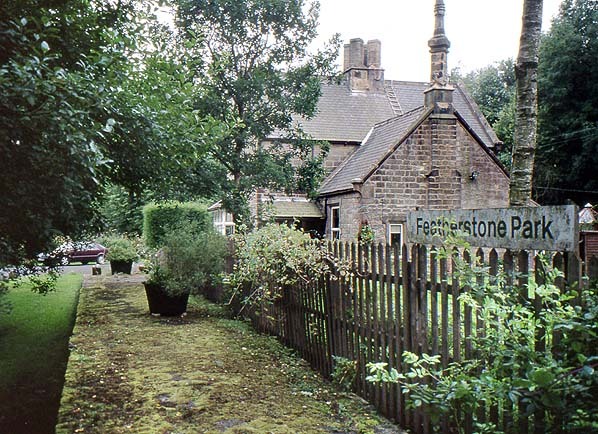 Notes: Few stations equalled the rural charm of Featherstone Park. On a visit in September 1962 the station resembled a neglected farmyard. Hens strolled around on the platform’s crumbling tarmac. Victorian oil lamps adorned the platform, with tiny tablets giving the station name; one rendered it Featherston Park. Behind the siding stretched the disused loading dock ending with a grassy bank; here, many yards from the passenger platform, was the large, lopsided, and almost illegible nameboard. 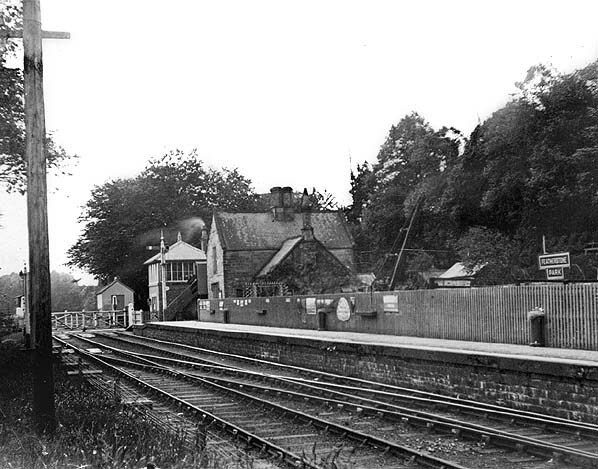 At the southern end of the platform were the house and hipped-roofed signal box, adjacent to the level crossing. Beyond the gated level crossing and, like the passenger facilities, west side of the running line, was an abandoned signal box. Abandoned coal cells stood across the line from the old signal box. where, in 1911, there were 15,094 tickets issued, more than twice the number of any other intermediate station, and almost 3,000 more than at Alston! During World War I the station served a military camp. Afterwards, with mining finished, passenger traffic declined so greatly that the LNER downgraded the station from 1932-40, with ‘check-tickets’ being issued and the fare paid at the destination. It was renamed Featherstone Park Halt from 1933-37. World War II revived business, with a military camp and prisoners-of-war housed in the domains of Featherstone Castle. In peacetime, passenger traffic declined again. In 1951 only 4,653 tickets were issued: the busiest intermediate station had become the quietest. The solitude made it ideal for parking the royal train overnight when King George VI was visiting Tyneside. 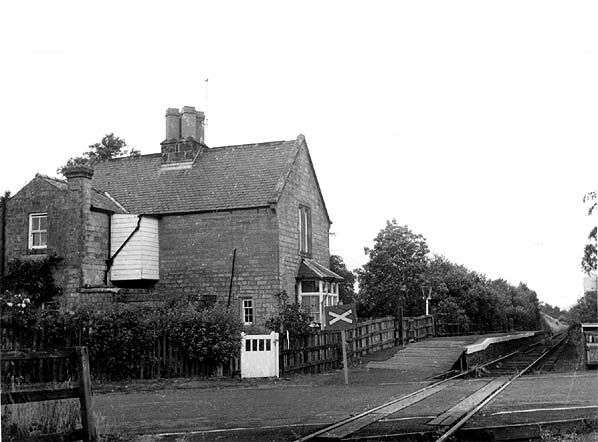 In 1954 goods traffic ceased, and the station became unstaffed. The stone-built house, which survives as a private residence, was of two storeys. On the platform elevation, were the main gable-end and a ground floor bay window. The main central section was flanked by a two-storey wing to the south and another of one storey to the north. The 86yd platform was stone fronted with tarmac surface. At its southern end, in front of the house, its height was reduced and it ended vertically, with a wooden ramp added. The branch required substantial earthworks and structures. There were no watersheds to cross, nor tunnels to bore, but the 13-mile route climbed from 405ft to 905ft above sea level and involved three crossings of the South Tyne and viaducts over tributaries. Most structures were designed for double track and sturdily built of sandstone. Lambley (Grade II*) is particularly striking, but others at Burnstones, Knar Burn and Gilderdale Burn, and the ‘Alston Arches over the Tyne at Haltwhistle (each Grade II) are also worthy of note. began in November 1852. Intermediate stations were Featherstone, Shaft Hill (closed 1853-62), Lambley, and Slaggyford. Unfortunately no sooner had the branch been completed that lead mining began a rapid and continuous decline. Depopulation accompanied this recession; the population in Alston, Garrigill, and Nenthead peaked at 6,815 in 1851 and fell almost continuously to only 1,909 in 1971. Some cheer was brought by limited development of coal and zinc mining. stopped at Park Village and occasionally at Burnstones and at various other points, including locations close to Softley and Whitwham; there were no platforms at these stopping places. With equal informality, if no one wished to join or alight, trains sometimes coasted through the stations, even when booked to call! Jenkins (The Alston Branch, 1991) assumes that motive power was provided in the mid-19th Century by former main line engines. Towards the end of that century Fletcher BTP 0-4-4Ts (classified as G6 by the LNER) were used, though in the NER period Worsdell Class A 2-4-2 Passenger Tanks were also employed. At first one engine was based at Alston. By 1900 there were two, one for passenger and the other for goods trains. Two elliptical-roof bogie coaches carried passengers in the early 20th Century, with a spare stabled at Alston. In the LNER period G5 0-4-4 and A8 4-6-2 tanks operated the passenger trains. Goods were hauled by J21 and J39 tender engines. The 1950s saw a variety of steam locomotives on the branch including ex-LMS 4MT 2-6-0 and 3MT 2-6-0’s. 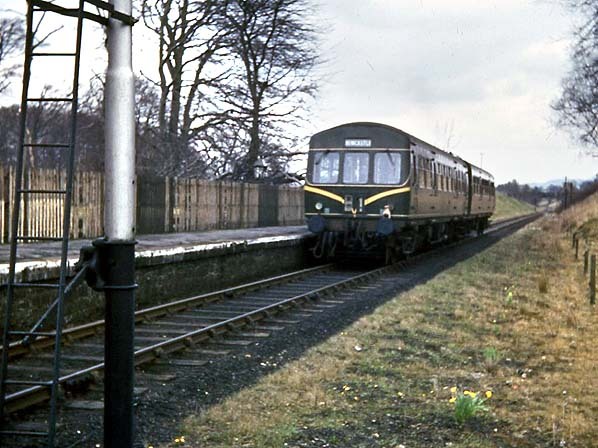 Passenger services were progressively taken over by dmus (generally Metro-Cammell Class 101) from autumn 1959, which operated until closure. However, German 56-seat railbuses were trialled on the branch in 1965. They gave a rough ride and were mechanically unreliable. Consequently they were not adopted, although they worked some East Anglian branches. The Alston Branch outlived many lines whose passenger carrying potential was greater. Blyth and Ashington, towns of some 30,000 people, lost their service in 1964; Featherstone Park, serving several hundred, survived until 1976. As a cost-cutting measure Featherstone Park and Slaggyford became unstaffed in 1954, and Coanwood in 1955. The first serious threat of closure to the branch was in 1959, but the NE Transport Users’ Consultative Committee reported that road services could not adequately replace trains, and closure was rejected. Severe weather in early 1963 disrupted road transport, yet trains continued between Haltwhistle and Alston, providing a ‘life-line’ for remote communities. Beeching (March 1963) noted that closure of the branch was already under consideration, but that summer Ernest Marples, Minister of Transport, announced that the service would continue; the sole criterion was hardship that closure would cause. Further economies were made. Alston’s trainshed was dismantled. Lambley, and Alston became unstaffed in 1966 and 1969 respectively. Goods services ceased in 1965, and in 1966 the ‘one engine in steam’ system began, allowing Coanwood, Lambley, and Alston signal boxes to close. Crossing gates at Featherstone Park and Coanwood were removed, trains giving way to road traffic. Most signals were dismantled, although some fixed distant semaphores were retained, set at caution; one was south of Featherstone Park. At Alston, for some time, a run-round facility remained. Happily, this is not the end of the story. 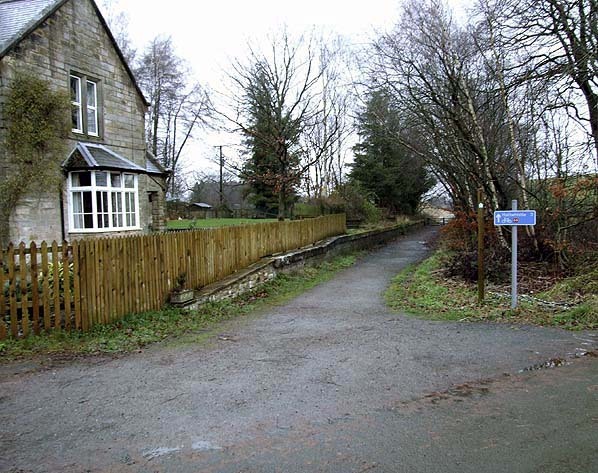 Cumbria County Council bought Alston station and the Cumbrian section of trackbed in 1979, enabling the station to be used as a tourist information centre. In 1983 the STRPS opened a 2ft gauge tourist railway at Alston, its trains hauled by Phoenix, a forty year-old 4-wheeled Hibberd 40hp diesel locomotive. The line was extended 1½ miles to Gilderdale Halt in 1986; a Light Railway Order was obtained in October 1987 for this section. A further ¼ mile to Kirkhaugh Halt opened in 1999. The South Tynedale Railway intends to reach Slaggyford, having obtained planning permission for this project in 1986, and ultimately Haltwhistle. Reinstatement of the branch has been aided by the English Tourist Board, the local authorities, and the Manpower Services Commission. Today the South Tyne Way footpath and cycleway follows the course of the Alston branch for much of its length. 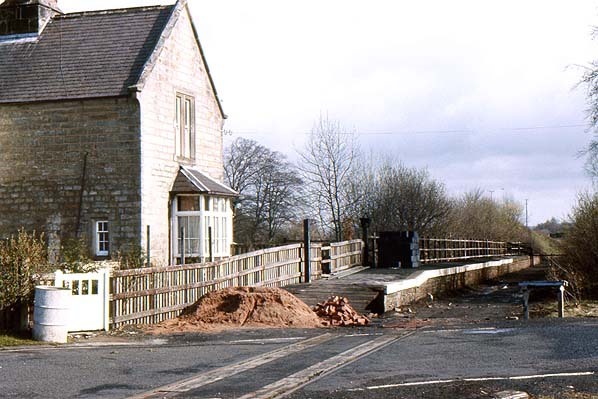 for the trackbed from Kirkhaugh to Slaggyford, including the station building at Slaggyford where some remedial work has started to ensure no further deterioration of the listed station building. A further extension of the line from Lintley to Slaggyford is planned to open in 2015. Available evidence suggests that the architect of the Alston branch stations was Benjamin Green, who also designed a series of handsome stations between Newcastle and Berwick, such as the surviving Acklington, Warkworth and Chathill (to which Alston station bears a strong resemblance). The intermediate station buildings at Featherstone Park, Lambley and Slaggyford, are described by Bill Fawcett as ‘economical and picturesque’ symmetrical two-storey houses distinguished by a steeply gabled projecting centre. (Coanwood’s station house was a later structure.) All were built of local stone. Until closure the rural charm of the stations was enhanced by their retention of elderly oil lanterns (with gas lighting at Alston). Whilst Alston retained its sturdy LNER wooden nameboard, still painted in BR(NE) tangerine, with raised white-painted metal letters, the other stations were (regrettably!) fitted with black-and-white ‘Corporate Identity’ nameboards following the line’s reprieve in 1963; these replaced wooden nameboards painted in a dark version of BR(NE) tangerine, the letters outlined but not in-filled – and almost illegible. In 1962-3 the name of Coanwood station was not displayed anywhere along the platform. Although all of the intermediate stations were de-staffed by 1967, none of them had Halt added to their name, even though the suffix was applied widely by British Rail until 1968-9. The North Eastern did not share other BR regions’ enthusiasm for the suffix: there were only five official public Halts in the Region. However the four intermediates were so named in an Eastern Region handbill of 1967. A sign near the entrance to Featherstone Park passengers that the station was an Unstaffed Halt, and the implications for ticket purchase. The other stations possibly carried such signs too. Tickets exist for each of the intermediate stations using Halt in their name. Other web sites: South Tynedale Railway. History, photographs, timetable and all the latest news of this popular line. Looking north towards Featherstone Park station in July 1968. Note the signal box has been demolished. 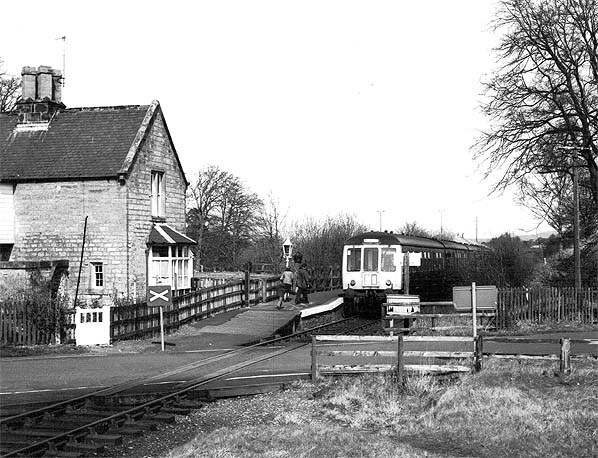 Featherstone Park station looking north in early 1970s. 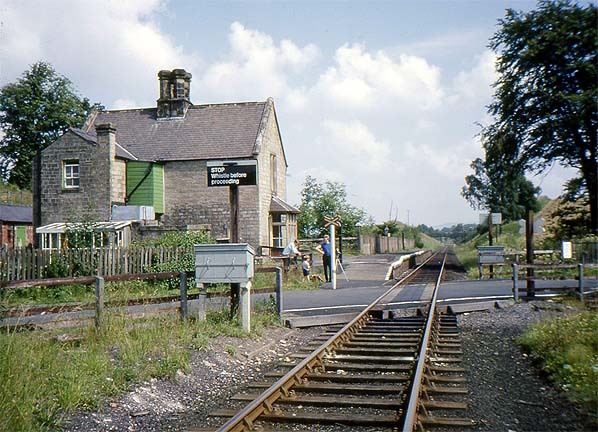 Featherstone Park station looking north in July 1976, two months after closure.